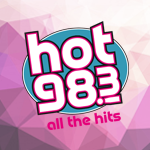 In the event that a child is young and needs assistance in calling or writing HOT 98.3, parental or guardian assistance is permitted in making the call or mailing the entry, but nothing more. Contestants may win a HOT 98.3 hourly and/or daily contest no more than once within any promotional period. The promotion period MAY BE specified in the Grand Prize rules. Multiple winners from the same household are NOT permitted. Individual contests may have different specific rules.